The Palm apartments has reached completion and this is the first semester residents are living in it. Students were given the choice to choose the new Palm phase last semester when picking their dorms for this year, so the new addition to residence life is not expected to make any significant changes to the number of students living in the Barrymore Hotel, according to Eric Cardenas, director of Public Information and Publication at UT. The final phase of Palm is considered to be the biggest residence hall on campus with 658 beds throughout the building. The majority of rooms are apartment style with four single rooms with a common living room, kitchen and bathroom, according to Nora Jarmon, director of housing in Residence Life. The dorm also features laundry rooms, meeting rooms and study lounges on every floor. UT announced in March of this year the start of construction for the Graduate and Health Studies building and since breaking ground last semester the building has grown a few stories high. The building is expected to be the new home for the nursing program as well as the physician assistant studies and UT’s Graduate Studies program. 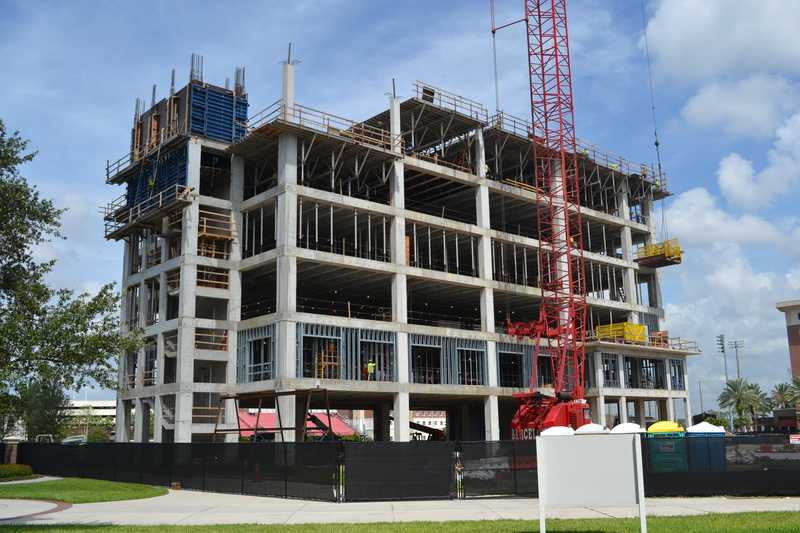 The building will hold classrooms, health science labs, study spaces and faculty offices. The project is expected to be completed prior to Fall 2018, according to Cardenas. Over the summer the residence hall was partially renovated before students moved in this semester. The renovations prior to the semester’s start came with the goal to bring it to the level of McKay Hall after it’s renovations in 2015, according to Cardenas. Renovations are being made to the pool and is closed for the first few weeks of the semester. The pool is scheduled to reopen in mid-September. The main court is still under construction and is set to open this Fall. The new court will be home to the new Beach Volleyball team. The team is scheduled to take the court during the Spring 2018 semester. Located in Plant Hall, Fletcher Lounge is being renovated and is set to open this Fall, as well. Fletcher Lounge will be closed for Sorority Recruitment that starts Sept. 14 and will go until Sept. 18.